While at the grocery store the other day, picking up ingredients for dinner Erik and I stumbled upon an end cap of Chips Ahoy! cookies. 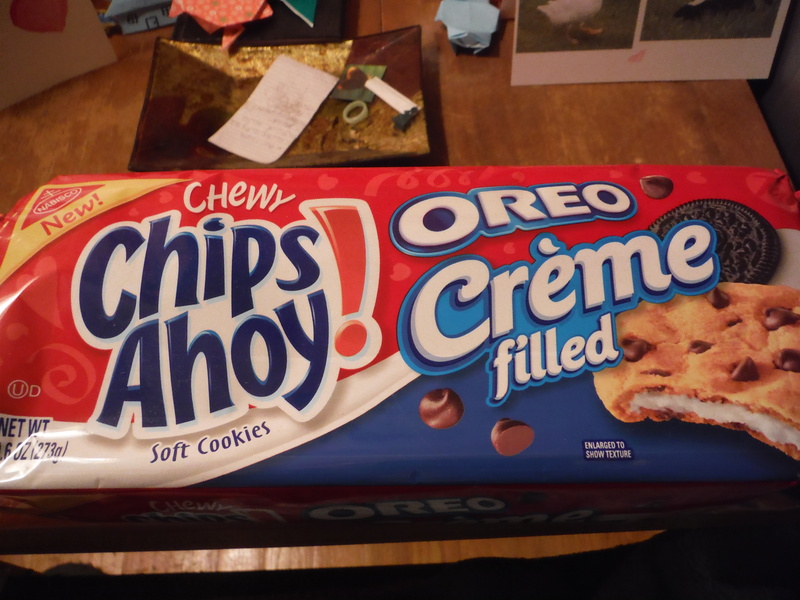 Included were Oreo crème filled, and birthday frosting filled chewy Chips Ahoy! Intrigued by all things new in the cookie world, we knew we had to check these out. First up for trial, the Oreo crème filled cookies. Considering how many times we’ve reviewed and/or mentioned Oreo products on this blog, you’d think they could at least send some free stuff our way by now, but alas, we had to pay for these with our own money. Out of the two flavors, these were the ones we were most interested in and had the greatest expectations for. 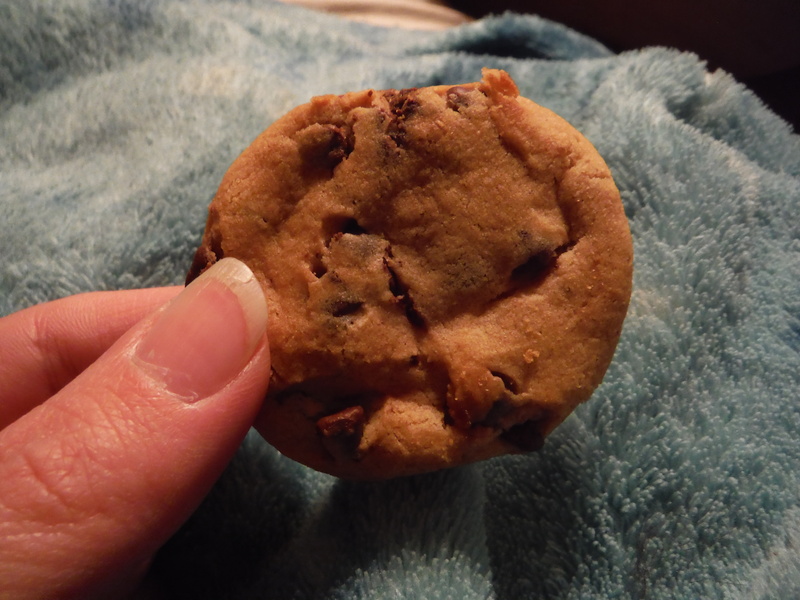 Oreos and chocolate chip are pretty much the most popular cookies ever, so the two combined have to be awesome, right? Just look at them all lined-up and filled with potential. 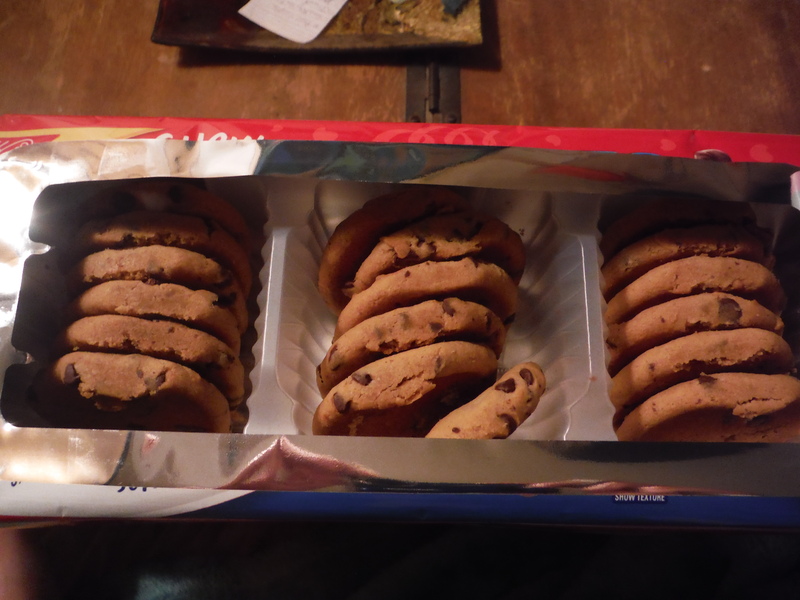 Unfortunately, these cookies were kind of disappointing. They still tasted good and satisfied dessert craving, but they didn’t live up to expectations. The first disappointment was relative lack of crème filling. There is definitely less crème filling than in Oreos (especially double stuffs). Or even if technically there is the same amount of crème filling, these cookies are larger than Oreos, so the ratio of filling to cookie is still off. I think this is what leads to the main problem – with so little crème filling it’s hard to really distinguish it from the rest of the cookie. The cookies don’t really taste like chocolate chip cookies with Oreo cream…they just taste like sweeter chocolate chip cookies. Without the chocolate cookie to serve as contrast to the vanilla crème, it just kind of gets lost. 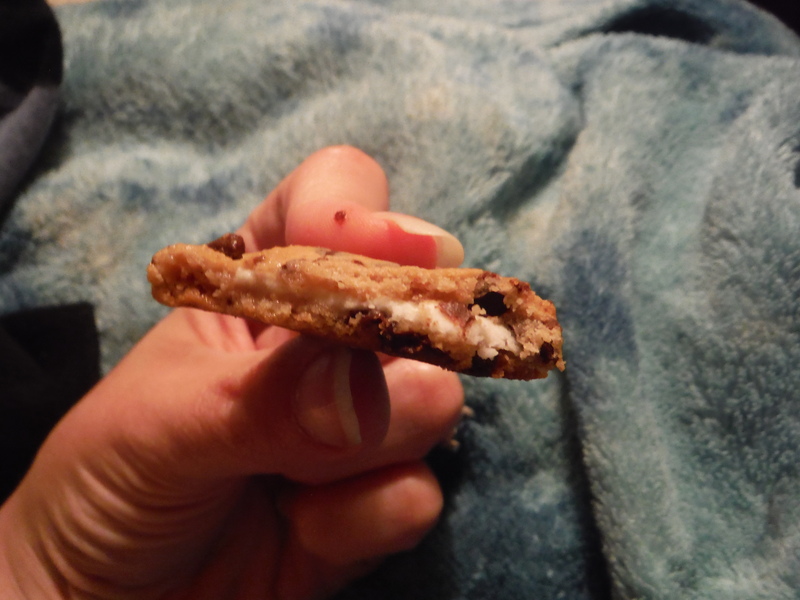 There aren’t enough chocolate chips in the cookie to help it stand out. So these cookies turn into another idea that’s great on paper, but not so great in real life. Turns out they were filled with disappointment, not potential. Would I recommend Chips Ahoy! Oreo Crème filled cookies? Not really, no. Posted on June 19, 2014, in The Snack Report and tagged cookies, crazy crossovers, dessert, disappointing, mediocre, review, snacks. Bookmark the permalink. 1 Comment.